Say you’re about to go to dinner at your favorite local restaurant. 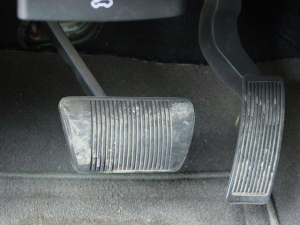 Would you drive with one foot on the accelerator and one on the brake? Not if you wanted to actually enjoy the fabulous meal awaiting you. But a lot of entrepreneurs try to build their businesses while metaphorically pushing on both the “stop” and “go” pedals at the same time. It’s time to stop the madness, and Michael Losier offers a powerful tool for doing just that. Losier is the author of The Law of Attraction: The Science of Attracting More of What You Want and Less of What You Don’t Want. Now, before you roll your eyes at yet another treatment of the LOA, let me assure you that this is one of the simplest explanations and most actionable road maps I’ve ever encountered. And since this 100-page book measures just 6 X 9 inches and contains a lot of white space, the few hours you’ll spend reading it will be one of your best investments ever in getting out of the way of your own success. To do this, he recommends one of my favorite techniques: Start with what you don’t want, then figure out what its 180-degree opposite is. This “clarity through contrast” approach typically works beautifully, since most of us can far more readily say what we don’t want to experience than what we do. When I first did this exercise, one of the items on my “don’t-want-this” list was “deal with daily rush-hour traffic”, and it was easy enough to identify the opposite as “avoid daily rush-hour traffic”. What I realized over time was this: In creating the experience of avoiding daily rush hour, I wasn’t necessarily insisting that I avoid all rush-hour traffic; I was simply clear that I didn’t want to have to handle it twice a day, every day. I ended up choosing to create a fulfilling home-based business that would enable me to avoid daily rush hours AND work in my areas of greatest enjoyment AND wear my bunny slippers in my home office. When you focus on the desired outcome rather than how you’ll achieve that outcome, you open yourself to a great variety of creative options. Better yet, you avoid getting fixated on thinking your outcome has to arrive in a certain package or look a certain way. This power of this approach lies in the fact that like attracts like. Most people would agree: If you look for something to complain about, you’re going to find it. Fortunately, the flip side is true as well: If you look for something to celebrate, you’re going to find it, too. So to raise your vibration means to set your sights on the good stuff (what you want) instead of dwelling on the bad stuff (what you don’t want), with the intention of getting more of the former and less of the latter. As you create your own desire statements, you’ll quickly realize how saying them raises your energy and excitement – and vibration. This was the most powerful and eye-opening step for me. In reading this section of the book, I finally realized just how often and effectively I was stepping on the gas and the brake simultaneously in the early days of creating my business. The power of Losier’s “allowing statements” lies in the fact that they refer to people other than you, which means that you’ll have no trouble believing and accepting the statements. This makes them very different than the usual affirmations which involve saying “I am [fill in the blank]” even when you’re not. For example, if I affirm that “I’m a lean and muscular 115 pounds” while being none of those things, I’ll almost inevitably get an immediate mental push-back of “Yeah, right!” This leads to doubt, self-criticism, and negativity – not such good tools for creating a desired outcome. My affirmation is the accelerator; my awareness of current outer circumstances is the brake. Pushing on both simultaneously gets me nowhere fast. An allowing statement, on the other hand, is something that I have no trouble believing, because the statement is not about me. In other words, by keeping myself out of the statement, I don’t give my critical brain a chance to sneer at a not-currently-true-about-me affirmation. Instead, I simply remind myself that my desired outcome has been and will be achieved by others, and this gives me permission to consider the possibility of joining their ranks. Dozens of women my age are healthier and more fit than they’ve ever been before. Thousands of people enjoy being at a healthy weight. Scores of women right here in my own city have lean, muscular, healthy physiques. See the difference between allowing statements and affirmations? If I affirm that I weigh in at a lean 115 pounds even though I’m substantially…fluffier…than that at the present time, it’s almost inevitable that I roll my eyes and basically call myself a liar. But if I contend that somewhere, someone is experiencing the outcome I desire, can I fully get behind that? Absolutely! You can choose to focus on optimism or pessimism, failure or success. Will some people consider this approach to be just a mind game and not worth their time or effort? Very possibly. Will others consider this approach to be a mind game with almost unlimited potential for improving the outcomes they create? Very possibly. Which camp do you choose to be part of? If you love the idea of being more proactive and effective in creating the business you yearn for, but you’re unsure about making these fundamental changes on your own, here’s an option to consider. I show my clients how to discard not only actions that don’t propel them forward, but also thoughts and beliefs that sabotage their success. Would you and I make a good team in this type of work? Perhaps. Perhaps not. But one easy and no-risk way to figure that out is to spend some time on the phone with each other. At the end of a 30- to 40-minute get-acquainted call, we’d both be confident in our mutual decision, whether it’s to go full speed ahead, throw the gears in reverse, or idle in neutral for the present time. Are you willing to allow the possibility that this exploration could be fun and valuable, regardless of the decision we come to? Then let’s set up that get-acquainted session. You can do that by calling me at 319-270-1214 (U.S.) or by emailing me with “I might be willing to allow it” in the subject line. We’ll see what shakes out to our mutual benefit. This entry was posted in mindset and tagged choice, personal power. Bookmark the permalink.